Deficit Spending - What Does It Mean? What is deficit spending? 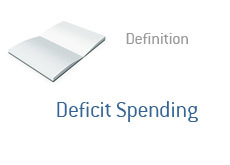 What is the definition of deficit spending? What does deficit spending mean? Deficit spending can apply to businesses, individuals or government bodies. Deficit spending can apply to different periods of time, such as a week, month or year. For the purposes of this article, we are going to focus on government deficit spending. Just like any business, a government has revenues and expenditures. If revenues exceed expenditures over the course of a year, then the government has posted a "surplus". If expenditures exceed revenues over the course of a year (which they normally do in most cases), then the government has posted a "deficit". If a government plans on expenditures exceeding revenues, then they are said to be engaging in "deficit spending". Make sure that you don't confuse a debt with a deficit - for more on that, please visit our Debt vs Deficit definition page.